8 Days Umbwe Route | . 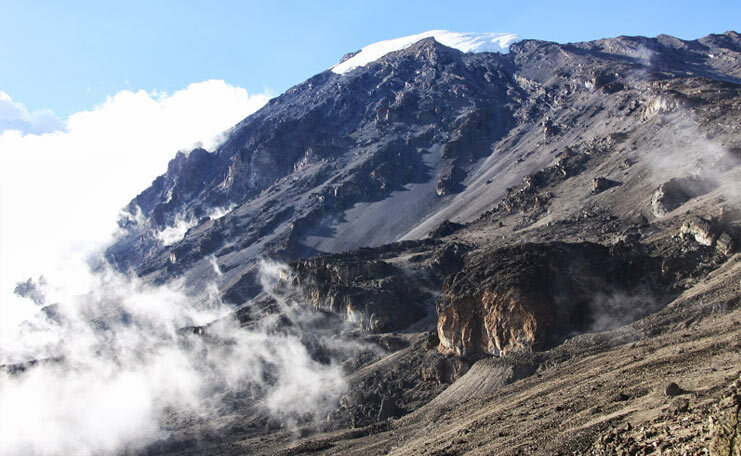 Mount Kilimanjaro Climb – The Umbwe Route provides the shortest route, and toughest, to the Southern Glaciers of Kilimanjaro and Western Breach of Kibo Peak. An ascent of Kibo by Umbwe Route is one of the finest non–technical climbing mountaineering. It is a challenging route, unsuitable for the solitary or for the inexperienced, and a route off the beaten track. This sound interesting and feel free to book your trek with Aardvark Expeditions Limited. Arrival in Kilimanjaro International Airport, Meet and assist at the airport and after going through Immigration, Baggage Claim and Customs, Transfer to Tulia Boutique Hotel & Spa to stay overnight at on Bed and Breakfast basis. We will gather in the evening for a pre–climbing briefing and climbing equipment check. We will also confirm that you have the appropriate mandatory medical coverage and travel insurance as well. After breakfast, we follow the trail through steep and scramble rock across rainforest to moorland. The path proceeds steep to the Southern Glacier Branches; at 4000m we reach our campsite, which is Barranco Camp, were we overnight. (6–7 hours walking). The day will begin with a descent in to the Gorge, before we climb its eastern wall where we will enjoy views of Mount Kilimanjaro’s ice fields, an equatorial anomaly. We will continue trekking until we reach our camp in Karanga Valley (13,900 feet, 4–5 hours walk). After finishing our breakfast, we will climb up through the Karanga Valley; the trail turns steadily uphill, following the lava ridge to the Barafu camp. The temperature will grow colder and the landscape more sparse as we near Barafu Campsite. Barafu Campsite is set on a small, exposed flat area on a ridge, acting as a base camp from which you will make your summit attempt at midnight tonight. Barafu Campsite (15,200 feet) it takes about 6–7 hours walk. After midnight we start the challenging trekking to the summit of Mount Kilimanjaro (12–17 hours of trek). You begin trekking at 12:30 to 1:00am, passing between the Rebmann and Tarzel glaciers to the rim at Stella Point. The temperatures range from just below freezing at midnight, to between 10 deg. F (-12 deg. C) to –10 F. (-23 deg. C) just before dawn at the summit. As dawn nears, we’ll summit at Uhuru Peak, the highest point in Africa at 19,340 feet. Uhuru Peak will be the culmination of – and the reward for – 6-7 hours of strenuous hiking. We’ll then descend back to Barafu Campsite, resting for a while before continuing our descent to Mweka Campsite (9,840 feet) it takes about 3–4 hours walking on the descent). After breakfast descend steeply through the forest on a narrow path, after 3–4 hours walking we will reach Mweka National Park Gate at 1400meters. Our company driver and vehicle will be waiting to transfer you back transferred to Arusha town in order to stay overnight at Tulia Boutique Hotel & Spa on Bed and Breakfast basis. Price cost US$ 1,790 per person. Price cost US$ 1,695 per person based on a group of 5 people onward.